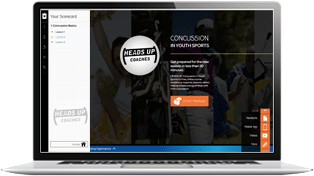 BAA requires of its coaches and officials the completion of the Center for Disease Control (CDC) Concussion Training Course. Concussions have become a major issue in all sports in the past years and it is our responsibility to make sure that all players participate in a safe manner. Follow the link to the right to complete the online training course (30-minutes), at least once every 3-years. It is geared towards coaches, but the basic principles remain the same. Upon completion of the course you will need to complete and pass the quiz, after which you will be given a PDF certificate to fill out and download/print. Please do so and forward on to the Chief Umpire. Without the certificate, you will not be given credit for the course. © 2012-2014 by Grant Gartland :: This website is NOT operated by the Bloomington Athletic Association, but is intended for use by it's baseball umpires.